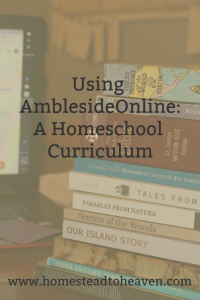 Somehow or other, I found this curriculum during my search for resources on “scholè” after reading “Teaching From Rest.” A few years ago, I was dead-set on using the Mother of Divine Grace Classical Curriculum, but last year, I took a look at what I felt like my family’s needs were, and ended up with deciding on AmblesideOnline (at least for this year). There is a bit of a learning curve to understanding the layout of the website, but from there it’s pretty simple and straightforward. For better understanding, I think Brandy Vincel, at Afterthoughts, does a great job at explaining how to use it. AO also has an AO for Groups feature which I love. With 3 children, each a year apart, the reading involved would have been too much separately. What AO for Groups does, is combine similar grades together, which allows you to rotate through those years together. This streamlines everyone’s schooling and makes for a very productive day. For our purposes, we’re using Form 1 A/B. If you’re looking for a Charlotte Mason curriculum that is specifically geared toward Catholics, check out Mater Amabilis. I had already planned out my year before discovering this website, but I did incorporate the Religion component to what we’re doing with AmblesideOnline. Okay, so it’s been about 6 months since I’ve read specifics on Charlotte Mason’s philosophy, but part of her philosophy was the concept of spending no more than 20-30 minutes on a given subject. This has been a huge part of our homeschool. For example, we spend about 15 minutes on Phonics. The first week, I tried to push the time limit with my 6 year old, and have him complete more of the lesson. He didn’t know that we were supposed to break after 15 minutes, but he started to melt and become very distracted not long after we should have been done that subject for the day. Now, depending on the child, I will have them finish the section we’re working on within the lesson at times, but I learned quickly to respect the time limit that we had set at the beginning. By following a specified amount of time per subject for our school day vs amount of material per day, I’ve found that our days can be both efficient and leisurely. 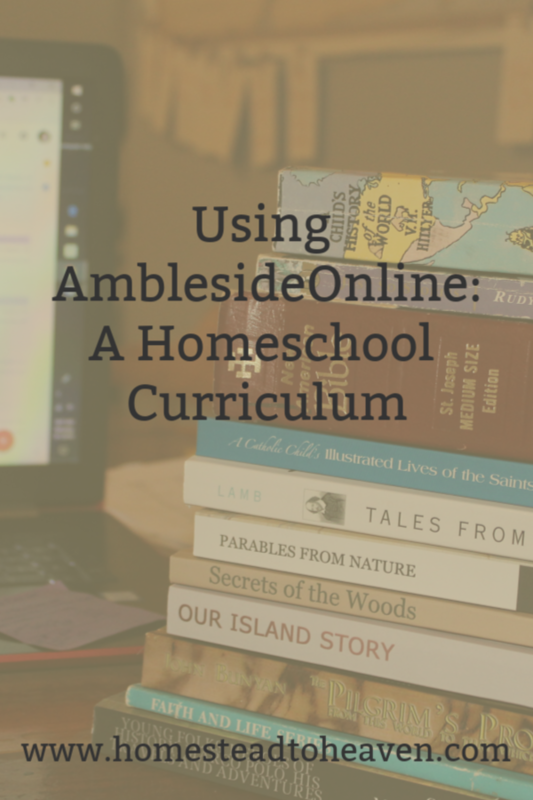 Since AmblesideOnline is a Charlotte Mason curriculum, it fits very nicely within these parameters. I haven’t yet had to try to rush through a subject in order to finish in time. Currently, Handiwork is finished for this term, the Nature Walk doesn’t always happen, and Picture Study consists of the picture, I introduced at the beginning of the year, taped to the wall. Wednesdays and Fridays we’re finished before Lunch. The other days we have about an hour or less left to go. Fridays will also be our co-op days with our local homeschool group. The co-op lasts for 6 weeks each in the fall then the spring. At the time of this post, we are learning about King Edward III, and travelling with Marco Polo on his adventures. Tookees the Mouse just learned the importance of fear for survival, while Jenny Wren makes her nest in the Old Orchard. Christian has made it to the gate in “Pilgrims Progress,” while “Just So Stories” amused us with the tale of “The Beginning of the Armadillos.” We’re taking a little detour with our French curriculum to spend some time on learning the numbers 1-20, but my kids would rather learn these numbers alongside their aunt in Spanish. Our religious studies have taken us through Genesis to the point where the flood has receded; Mary and Joseph have just taken baby Jesus to the temple in the Gospel of Luke; and our Catechism has taught us the importance of Obedience to God and is supplemented with preparation workbooks for the Sacrament of Reconciliation. Finally, we’re taking our knowledge of the different elements in art (lines, dots, circles, etc. ), to draw still pictures of things in our environment. At the beginning of the year, there were a few more beautiful “subjects” in our day, but we found that they didn’t contribute to our over-all peace. So, for now, we’ve cut some of the fluff in order to find enjoyment and peace in the things we are learning. In all of this we’re working toward peace in our homeschool. And you know what? There have been many (mostly) peaceful school days so far. Here’s to hope that they will continue! I loѵe reading a post that can make people think.